I worked with my dad on a strategy to get through Pokemon X as quickly as possible. Find a good team, and stick with it. Do not waste time on collecting many Pokemon. That worked well and cut down game play time. 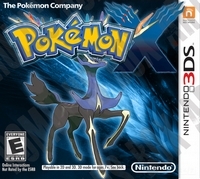 Pokemon X and Pokemon Y is the biggest leap forward in the franchise for some time. Problem is Pokemon has consistently fallen behind over the years. The 3D is neat in Pokemon X and Pokemon Y. Unfortunately the camera is stagnant. Which means I might not be able to see inside the kitchen in certain houses. This is mildly irritating, but it was also easily fixable. The presentation of the game, and its screens are improved. Very streamlined. The battle screens look bland to me. Plenty of graphics are re-used in portions of this game. Speaking of rehash, Pokemon X and Pokemon Y borrows heavily from previous Pokemon games. In fact there are few original ideas in this hand held video game. I like being a part of five friends and fighting against a group of bad guys who are selfish. This is disappointing after spending forty dollars on the game. If you get both Pokemon X and Pokemon Y on the Nintendo 3DS then you spend eighty dollars. Which is a real waste since the game is essentially the same. All to get a different legendary. I know Nintendo has done this two games that are the same for years now. But at some point we gamers have to expect better. We have to say: “Hey don’t expect me to pay twice for the same game.” Find a better way, like having a quest after the game is beaten to find the second legendary. I know its all about money and Nintendo will keep doing it as long as people are willing to pay for it. Pokemon X and Pokemon Y shoves the religious belief of evolution down our throats. This Nintendo 3DS enhances that religious belief as well with the mega evolutions. This is a temporary in battle increase of the Pokemon’s powers. It is like Goku going Super Saiyan for a bit, and then back to normal later. After the first gym I was given a very handy item - experience share. That way any Pokemon in your party can share in the experience earned. None of your Pokemon in the boxes receive any experience. So Pokemon X and Pokemon Y takes one small step forward, but not anywhere near the industry standard. We also earn experience in Pokemon X and Pokemon Y from catching Pokemon. So that is nice, and something that has been needed for years. The color coding of the Pokeballs is also very welcome in Pokemon X and Pokemon Y. The keyboard inside Pokemon X and Pokemon Y is a real pain to work with. It glitches way too often. The Poke War from the past is one of the most interesting story plot points in Pokemon X and Pokemon Y. After you beat Pokemon X and Pokemon Y (which took me twenty-two hours) there is very little to do. You can work on collecting legendary Pokemon if you are not transferring them from a previous Pokemon game through Pokemon Bank. Older Pokemon characters are available from the beginning. Which enhanced the rehash feel of Pokemon X and Pokemon Y. Plus I knew the strengths and weaknesses of those Pokemon. So why take any chances on something new? The original starter Pokemon are nice, but again left me little reason to try anything new. In my opinion Pokemon X and Pokemon Y is worth about twenty dollars if you can handle the opposite of intelligent design being shoved down your throat.